Well it hasn't been easy! Luckily I have had boxes upon boxes upon boxes of stuff to go through to keep me occupied! We are in our new place, and it is great...but smaller than our last place, so there is a lot of stuff that has to go, and that is a good thing! Who needs all this stuff? Not me! I will be stocking the shelves of the local Goodwill for weeks to come. My husband is off until the 5th before he starts his 40 hour a week internship (unpaid) and his as many hours as he can get patient transport job (paid) at the hospital. So I will be spending the weekend unpacking and getting my house in order while soaking up as much time as possible with him before I am back for good. I will have a Making the World Cuter Monday up for all of you who want to throw a little cuteness our way on the 4th though! Be sure to come back next week, I will have a fun giveaway for your kids summer getaways, a couple reviews, maybe a tutorial on some fun projects I made before the move that didn't get posted and hopefully some more cute stuff! Since my hubby will be working ALL the time, I am hoping to be able to spend a lot of time working to make the world cuter...or at least my little corner of it! Who doesn't love free fabric!! Am I right? 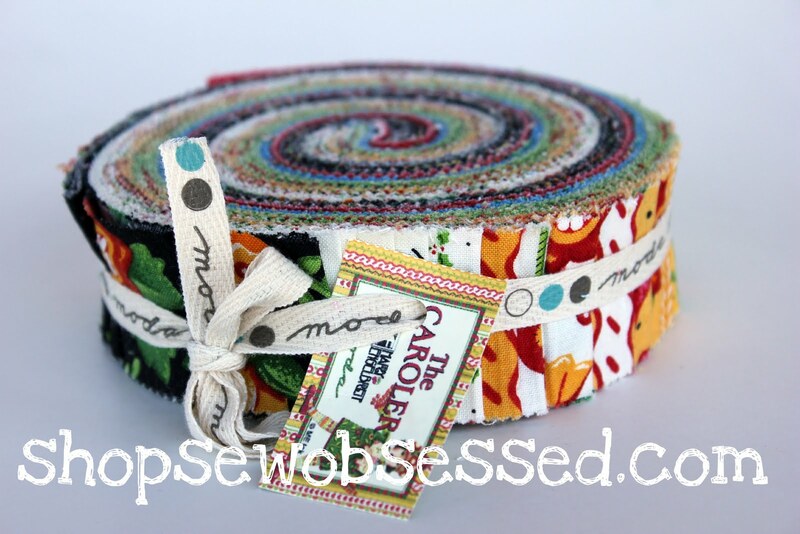 Annie from Sewobsessedquilts.com is hosting a giveaway for this darling Mary Engelbreit Honey bun from her Caroler line. Get started on your Christmas projects now! Visit the online shop and tell me what your favorite product is! Please leave separate comments for each! Annie is also offering an exclusive discount to you readers. Just enter the code "CUTE" to recieve 15% off your purchase online. fine print: giveaway open to all US residents 18+, void where prohibited. If you would like to sponsor a Making the World Cuter Monday, please contact me. Check out these other LINKY PARTIES for more partying fun! It's moving day today! Yikes! While I am busy sweating and hauling boxes on and off the truck today, I have a fun little treat for you from a new blogger-go on over and give her some bloggy love! Materials: canvas, scissors, paint, pink paper, regular white paper, glue, ribbon or rhinestones or other embellishments. 1. Paint a hanger on your canvas (this step is optional). 3. Trace that shape onto your pink paper and cut it out. 4. Glue the leotard shape to the hanger you painted and let it dry OR if you skipped the first step, just glue the leotard to your canvas making certain you leave enough room at the bottom for hand prints to form the tutu. 5. 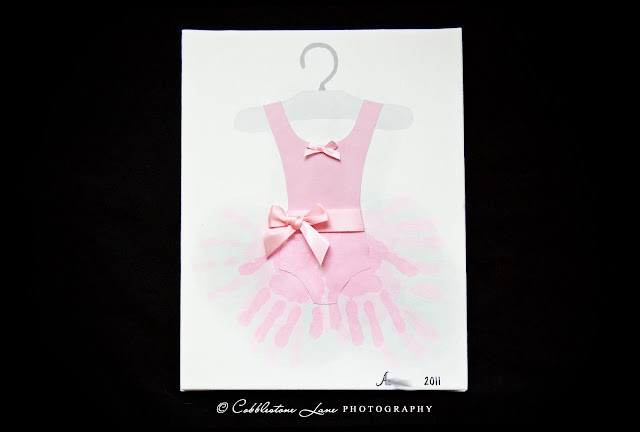 Paint your daughter's hands and place them on the canvas around the leotard to create a full tutu effect. On ours, we used four hand prints in a light pink first, then after those had dried, we made two more hand prints on top of the light pink hand prints in a darker pink shade (see finished project below). Allow these to dry. BTW: if you are using a pre-stretched canvas, you may want to place a book under the area of canvas where your child will be placing her hand prints to avoid denting or pushing through the canvas. 6. Glue a section of pink ribbon and a bow around the waist of your "tutu". Make and glue a smaller bow to the top of your leotard or the hanger (see finished project photograph). You might also want to add other embellishments of your own to the leotard and tutu (rhinestones, real tulle, etc.). Thanks Michelle! It turned out really cute, I know my little dancer would love it! If you would like to have one of your tutorials featured on Making the World Cuter-contact me. Thanks for reading, and I promise to be back soon with all new and fun stuff! If you have a tutorial to share-especially if it's something fun for the summer-send me an email and we'll get it up and featured! This wreath served me well for many a month, and I think it works well for summer too, if I have time and energy once I move to Bend, I think I'll make some more buttons and paint them with some patio paint in bright colors like yellow, orange and teal. The buttons on this one have cracked paint because I never did seal them off before I stuck them out in the weather, but it still looks cute sitting in my room waiting for it's next makeover....Let the flashback begin NOW! So I needed to put together a tutorial, I looked around the house, found some burlap, some red gingham and a floral wreath. Okay, I could work with that. This wreath was super easy, involved no sewing or gluing, and could literally take you about five minutes to create. I took a little bit longer of course, because I can't do a five minute craft and think that it's done. I always have to do a bit more. Let's get on with the tutorial shall we? First I cut long strips of burlap, I think I ended up using 4 strips in all. Then I just wrapped them around, overlapping the ends to keep them all on. This is the base of my wreath-simple yes? But with such simplicity comes great responsibility, I mean creativity. At the end of my wrappings I had the end of my strip that I needed to attach, but remember I said no glue right? Enter small strip of gingham tied around the burlap. I did this around the wreath spacing it out as I went.I could have been done there, hung it up, and went to bed, it's a cute wreath, I can change out the gingham for other fabric strips or ribbon with the different seasons or holidays, or whenever the mood strikes...but that just would be too easy for me! I went to my craft closet, which is full of stuff I intend to use one day, but usually don't. Well I had these giant buttons that I made out of salt dough using a large glass for the circle, a smaller glass for the rim and a straw to poke the holes. I was going to make ornaments out of them...but got busy, forgot, or maybe I just lost interest. So I painted up 5 of them in my favorite 3 colors. I used another strip of gingham through the top hole and then I grabbed some yarn. And there you have it, buttons on my burlap wreath! It's very valentine-ish and looks pretty hanging on my shelf...but I think I will spray the buttons with some clear spray so that I can hang it out on my front door. It is quite large, so I think it will make a big statement front and center. ...and I may need to add another black button, I have a thing about even numbers, and I know it will bug me every time I look at it. But other than that...what do you think? ***Edit: I have been asked by a couple people about the salt dough. You can find lots of recipes online, but the one I usually use is 2 parts flour to 1 part salt and 1 part water. So if you use 2 cups of flour, use 1 cup of salt (fine) and 1 cup of water. Knead it and either roll it out and cut it with cookie cutters (or in my case for the buttons-glasses and a straw) or you can hand mold it into anything you want. Then you can either air dry it-which can take several days, or you can put it into a warm oven (200 F) for about 3-4 hours, less if your project is flat, more if it's large.